Thoracic aortic aneurysm disease is an important cause of morbidity and mortality. Recognizing the specific disorder responsible for the condition informs management, including screening of first-degree relatives, imaging strategies, and determining the timing of prophylactic surgery or endovascular repair. Pharmacologic therapy typically involves beta adrenergic blocking agents, which slow the heart rate and lower blood pressure. Hemodynamic benefits of beta blockers may lessen stress on the aortic wall and are beneficial in Marfan syndrome and aortic dissection. Angiotensin receptor blockers have demonstrated benefit in patients with Marfan syndrome, and ongoing trials worldwide using these agents hold the promise of additional therapy to potentially retard aortic growth. Research into underlying mechanisms of disease utilizing animal models may translate into therapies which target various signaling pathways involved in these disorders. Lifestyle modification impacting intensity of physical activity, employment, and pregnancy are important aspects of medical management of thoracic aortic diseases. 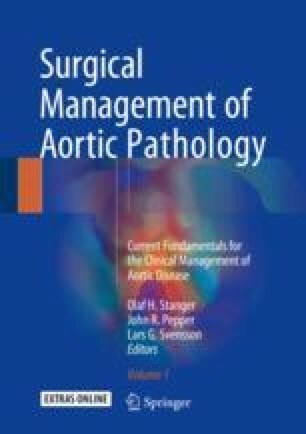 Long-term imaging surveillance, before surgery and after repair, is necessary to detect aortic developing pathology.